A few months ago I read an interesting article about Beyond Meat. Around the same time I also happened upon a coupon Beyond Meat was offering for a free package of one of their products. We tried the chicken strips in a salad at Whole Foods once but had never cooked with the stuff. Since it was free I figured we’d give it a try and I picked up a package of the faux ground beef (retail price, $5,99 for a 12 oz. package). Then I put it in the freezer and didn’t pull it out until recently. I sort of forgot about it but also it’s probably been 20 years since I cooked with ground beef and I wasn’t sure what to do with it. Finally one day Darlene suggested we use it to make tacos so that’s what we did. First, the package was a bit small and I wasn’t sure we’d have enough so I added some homemade seitan we had in the fridge (we got this particular recipe long ago from the Real Food Daily cookbook and it’s posted here). 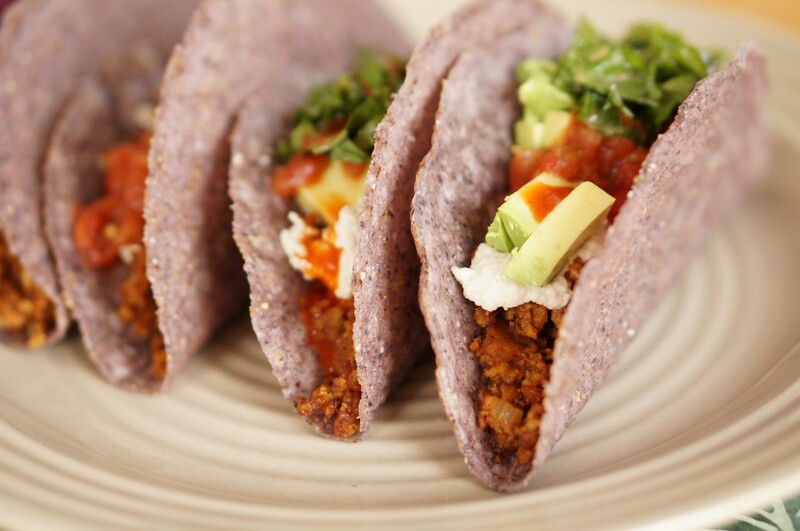 Typically we might make tacos using only the seitan, or maybe some tofu or refried beans. I think people who are new to veganism (or are just trying to eat less meat) find these meat substitutes convenient because they’re not sure how else to make their favorite meals. That’s not an issue for us and it shouldn’t be for you either with just a little bit of experience (or just poking around on the interwebs). Can you tell where the Beyond Meat stops and the homemade seitan starts? I can’t. So with a bit of experience and/or research on-line or in cookbooks, you can find plenty of fabulous meals to make without resorting to meat substitutes. To the extent that they provide a convenient alternative for people who might otherwise be eating meat, Beyond Meat and other similar products are fine with me. The main problem I have with them is the cost. The package of faux ground beef we used was $8 a pound and that’s a little much for us to be buying on a regular basis when there are so many less expensive alternatives. These products can also give people the idea that eating vegan is expensive when in fact quite the opposite is true. I applaud companies like Beyond Meat for bringing disruptive technology to bear in an attempt to change the world and I hope they’re successful. Until this stuff is selling at mainstream grocery stores for less than the cost of meat though that success will be slow in coming. I think they still have a long way to go because they won’t change the world with products that sell for $8 a pound at Whole Foods.